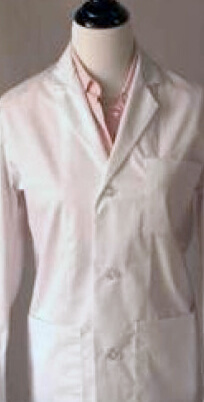 The Jacket is the traditional waist-length consultation coat. It has large lower inside and outside pockets, sewn down facings, and reinforced pocket corners. Customize by adding features like zippers, chef buttons, loose or sewn-down belts, and iPad-sized pockets. Personalize it by adding embroidery and a logo.